Save hours of paving research in 8MIN. HOW? Learn from Matt’s research – watch this 8 minute video below. What can become issues with rigid (cement based) paving? How can I see how well StoneSet holds up over time? 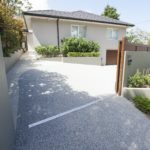 How expensive is StoneSet compared with exposed aggregate? What are the hidden hassles with demolition and repaving? When the first fleet landed in Australia, the early settlers went about their own ‘little Britain’ – building, changing and naming the new land to best resemble the homeland, as was the fashion with colonialists at the time! As such, the highest qualit, most decorative, easily carved sandstone was used first, to build most of the building foundations of ‘the Rocks’ which still stand today. 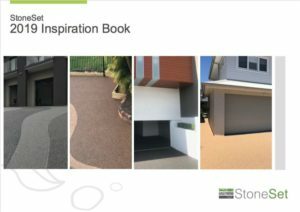 As a result, and a testament to the ideal paving properties of Sandstone – durability, workability, porosity and non slip surface. Crazy Paving is ubiquitous across Sydney on patios, pathways and even driveways. 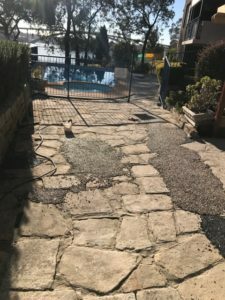 Below some examples of decades old sandstone ‘crazy paving’ we have resurfaced for pool surrounds and pathways across Australia. 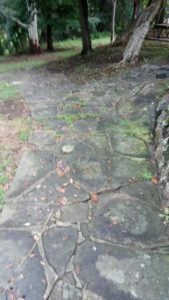 Sometimes over 100 years old, many home owners have found they have had enough of their Crazy paving. Cracked, patched, stained and outdated – Crazy paving is not only showing its age but can pose a trip hazard. Often the stained, old sandstone is not in keeping with new houses or the colours used for modern building materials. We speak with Matt (who has engineering experience in Naval architecture) about his choice in StoneSet, particularly due to the flexible nature of resins. 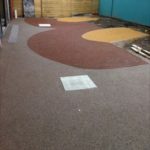 Having worked in ship building where flexible fibreglass resins are common, Matt has an advanced understanding of resin and the suitability for applications where non rigid paving is required. 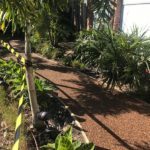 What happens when you have cracked, patched and tired sandstone pavers with a young family and two dogs? Levelling – Crazy paving is seldom a smooth, flat surface – with lumps and dips, often in the concrete grout lines. Remedial repairs – New sandstone looks very different to 50 year old sandstone. As such ‘patch repairs’ are quite obvious and not aesthetically pleasing. Hassle – Demolition, removal, concreters, pavers and landscapers. These are all the trades that can become involved in a project like this. 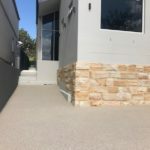 Mess – Living in the house through a renovation can be a nightmare – with small children and two dogs, this family was not interested in the elaborate hassle involved with pulling out the old sandstone and repaving. How does StoneSet overcome these issues? 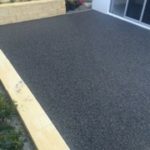 Levelling – Stoneset can level even the most uneven surfaces, it can be applied anywhere from 12-25mm thick, providing you with a brand new, smooth surface. Cracking – Short of soft fall rubber, StoneSet’s polyurethane resin is one of the most flexible paving options available on the market. Read more about why in this post. Remedial repairs -StoneSet has over 30 standard ‘colours’ of stone. 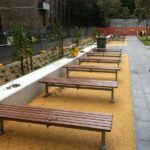 The colours are not synthetic pigments, but the ‘natural’ colour occurring from the oxidised mineral of quartz and granite that is quarried in a sustainable way in Australia. With a practically unlimited number of blends we can create from these 30 ‘standard’ stone colours, we seldom find an old stone colour we can not match.